Zack’s golden sun beams against my black silk gown, against my heart. Surrounded by TV cameras, lights and flash bulbs on this hot D.C. summer night, I wear it as proudly as a medal – a badge of courage for a small boy. Not so long ago, on another June evening, the light was dim, the gown was hospital issue, and I was in bed, my heart pounding from medication, not excitement. I stared out the window, at the slit of mauve sky between the tall towers of Cedars- Sinai, watching the smoggy West Hollywood dusk darken, listening to the beeping of monitors and the rattling of carts and gurneys in the hall. During the summer of 1982, I never felt the sun. I spent it in the florescent twilight of Cedars, flat on my back, trying to keep my baby from being born. My hands were so shaky from the drugs that prevented labor that I could not hold a pencil to draw. But, until then, not a month of my life had gone by in which I was not drawing or painting or making something of clay or plaster or metal. As a child, my favorite activity was always art. But it wasn’t until sixth grade ,when my teacher said “Have you ever thought of going to art school” that I discovered there was such a school and a way to become an artist as a life choice. I chose it, relieved to be able to name what I was. In art school, I studied sculpture , in grad school, theater design, and for the ten years before my pregnancy, I worked as a designer of costumes and sets. But, while in the midst of making drawings for a production of Stravinsky’s Oedipus Rex at the Hollywood Bowl, the fates ended my career. I spent two months in the hospital to stop the premature labor, and then gave birth to a fragile baby boy nine weeks too soon. He needed needed major open chest surgery the night he was born, and spent his first two months in the hospital. For the next couple of years I was engulfed by Zack’s medical problems. There were frequent trips back to E.R, problems keeping his food down and a diagnosis of “failure to thrive”, weeks in critical condition in the intensive care unit, more surgeries, transfusions, gastro tube, tracheostomy, infections. I was far too busy to make it out to my studio except to finger paint with my Zack and make one drawing about his birth — an annunciation in which the angel appeared as a headless, winged oxygen tank. Finally, by age two, Zack was plump and happy and talking in spite of the trach tube. I was so relieved to see my son living a normal life, delighted by his development, and charmed by his joie de vivre that I never thought about making art nor notice that I missed it. During the daytime I enjoyed my boy. I remember him laughing as he ran across the living room, dark eyes dancing, brown bangs flying, naked except for a necklace: a sterling silver tracheotomy tube, tied on with white cotton ribbons, like a girl’s choker. In order to talk, he had to cover the hole with his plump little chin, inducing him to drop his head and gaze up coyly. “Mister Bear eat bambooooo!” he repeated, waving his stuffed panda bear. His high sweet voice had a slight whistle, a reediness not unwelcome in a home where his father was a woodwind player. Zack loved painting and music and, with his dad’s baton, conducted the overture from his favorite recording of the musical of Peter Pan, keeping perfect time. At night, after the toy trains and their wooden tracks were put away, stories read and lullabies sung, I would drop into sleep, alone with my unconscious. The art dreams began with visits to art galleries. There, I found vitrines filled with small mysterious objects of cast glass, culled from no particular time or culture: translucent, pale aquamarine and rose sensuous shapes that I longed to hold in my palm. Another night, a vitrine grew great gray feathered wings that extended from each side. It’s glass shelves were filled with strange magical medical paraphernalia, objects a wizard might use to cure any ailment my son could ever have. Soon, the dream sculpture grew too large to be contained in a glass case. I remember an elaborate mantel piece of carved and painted wood — baroque tramp art as executed by Louise Nevelson – that covered a wall up to the ceiling. Over time, the art dreams increased in frequency, urgency and complexity until I was watching nightly screenings, technicolor extravaganzas of set design. Whole buildings would appear: Mexican folk art churches roofed in cobalt, white stucco niches filled with fantastic carved and brightly painted creatures. Then I would walk through entire detailed and intricate towns, as lacy, colorful and whimsical as the inlaid mosaic towers of Simon Rodia or Gaudi. When I awoke, I was amazed. My God, that was beautiful! For an instant, I was impressed with myself, with the creativity of my sleeping brain. But then frustration: I didn’t have the wherewithal to produce even a small section of what I had seen. Why couldn’t there be a photograph or video? The dreams reminded me that I was an artist, but their complexity was in inverse proportion to my ability to recreate them. Walking into Zack’s room at dawn to greet him, the oneiric edifices crumbled, leaving only faint afterimages glowing on the screen of my mind, soon forgotten with the smell of his soft hair and the feel of warm little hands wrapped around my neck. 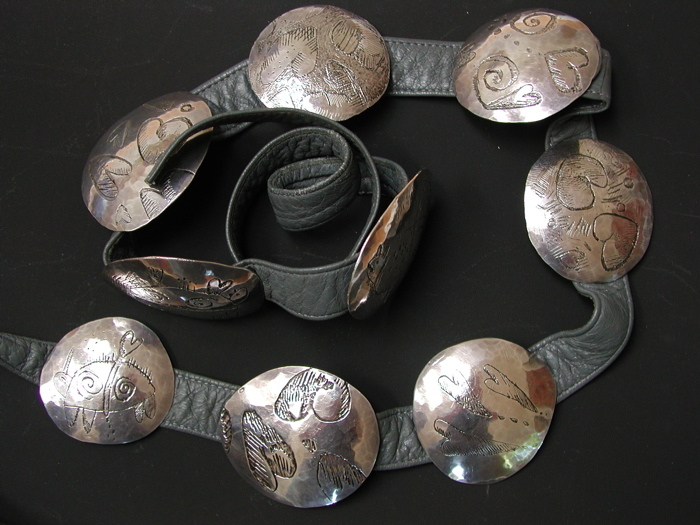 Then one night my dreams offered up an object small and simple: a silver concho belt made of etched hammered circles. I awoke inspired. Here was something I could actually remember, draw and might be able to make! I had studied silver smithing but had no tools I discovered a metal workshop that met on Saturday mornings. Zack’s trach had been removed— although the stoma [hole] remained — and he loved having sitters over to play with him.. Soon a sheet of sterling gleamed before me on the workbench as I sawed and hammered the silver domes for the conchos. I unearthed old etching materials, brought the silver disks home to finish in my studio. My jeans were tattered from spattered acid, but I had a silver belt to wear. And, at last, I was making things again. The designs etched on the concho disks were not traditional Indian patterns. They sprang right from my unconscious, as had the belt, from doodles rather than dreams. Popping up on the pad by the phone was a primitive four-legged animal that took in hearts (via it’s mouth or, more magically, from it’s back) and excreted a stream of little circles I realized the creature was a symbol for my son. My life with Zack in those days seemed to be spent pouring in love and cleaning up poop, endless streams of it. Zack’s frequent, mysterious diarrhea baffled the gastroenterologist, necessitated diapers. Too often, we would be ready to walk out the door, Zack just dressed in clean clothes when I would hear his alarmed call, “Mom!”, turn to see him frozen in place, face stricken, brown liquid trickling down his legs below his shorts. Nonetheless, Zack was accepted at and began preschool, taking along an engineer’s red bandana to protect the opening in his neck when he played in the sandbox in his striped overalls. As I stood back to watch on the first day, I couldn’t hold in the tears as Zack played joyously alongside normal children, children who had healthy beginnings. Years of worrying about his survival and development were finally at an end. And now I had two and a half uninterrupted hours to work in my studio each morning. Jewelry was small enough that I could get quite a bit done in that amount of time, and the silver soon held its own as reduced sculpture — small bits of meaning, not simply decoration. I felt myself return to normalcy, saw a window opening into my future: my son would be robust, I would be a working professional artist once again. I would be able to leave my marriage, escape my husband’s drinking which had worsened after Zack was born. After all, except for the diarrhea, frequent ear infections and Zack’s small stature, my exuberant son seemed to be thriving. Before he began his second year of preschool, in August of 1986, Zack had surgery to close the trach site. There was something abnormal in the blood tests, but his pediatrician told us not to worry as she ordered more testing, “He is a sick kid who has gotten better. He can’t have it.” But at three A.M. I awoke and put together the symptoms and the transfusions and knew, days before the results were in. My boy had AIDS. It was just before his fourth birthday Our doctors had no treatments of any kind to offer. Nothing. Absolutely nothing. While I grasped at straws to keep my son alive, researching fruitlessly, silver smithing took on new meaning. Metal seemed a firm, if temporary, handhold out of unbearable maternal powerlessness. My Saturday class was sacrosanct throughout Zack’s deterioration, the only respite. While I was there, I concentrated on the work in front of me. Sawing, sanding and soldering almost drove away the ache in my chest for three whole hours. The control I lacked over AIDS, I could exert over metal; I could conceive and bring a piece to fruition in a day. 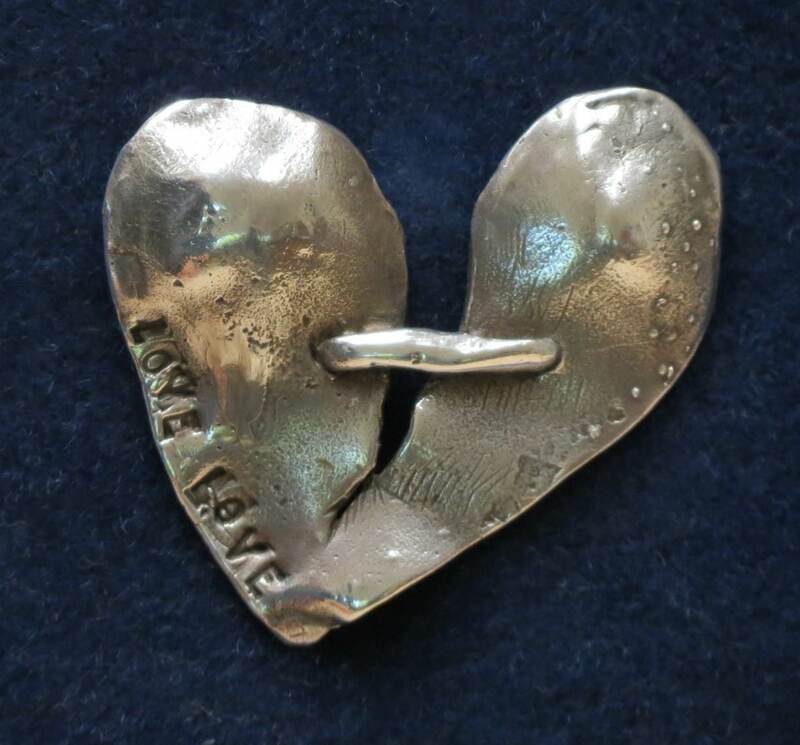 As my boy’s life was slowly extinguished, small sculptures were born and completed: pendants and brooches in the shape of torn or broken hearts tenuously stitched together. I made a bracelet for myself that Zack knew was about him, stamped with old typewriter keys in soft wax:: Z… .My sunshine…. you are my sunshine. By the time Zack was four and a half, I had experimented with unusual ways of creating waxes for casting. When I poured melted wax directly into hollow forms scooped out in clay, I realized that the process would enable Zack to make jewelry with me. He had inherited my artistic genes. Obsessed by trains, he drew train tracks at age two and a half. By four, he loved to paint and draw trains and cats and his stuffed panda, Bumby. He even drew a special train “For my Momma” with pink hearts drifting out of the smokestack. Seated in my studio, Zack and I rolled and flattened a ball of clay with a rolling pin, just like play dough. Then I showed him how to use a pencil to incise in the clay. As he bent over the gray slab to draw a train, his brown bangs shone with gold in the sunlight streaming through the windows, hid his brown eyes, but not the dark crescents beneath them. I gave him a serrated tool to poke a little frame around his image, then we rolled snakes of clay to build a dike, poured the melted wax inside, let it cool and washed the clay off the positive wax “pattern” which would be cast in metal. Since the AIDS diagnosis, I had frantically investigated alternative treatments, diet and nutrition hoping to keep him alive until a medicine was found. But I was fighting a losing battle – there wasn’t much to offer a child. Even acupuncture needles would have added to his trauma; energy healing was all I could provide. Now Zack and I had a new ritual: after dropping off our wax patterns for casting, or picking up our metal in Glendale, we drove to the nearby Healing Light Center for the energy work which relaxed Zack and made him feel temporarily better. Last, if he was able, we headed to Griffith park to ride the trains. On Saturdays, in the metal studio, the sterling heart-shaped brooches and pendants I created became attenuated and fragile. At home in my studio, Zack drew in the clay, despite the pain meds that made him groggy, while I finished , oxidized and polished his pieces. We made bronze train belt buckles for his dad and silver train pendants for me and friends. 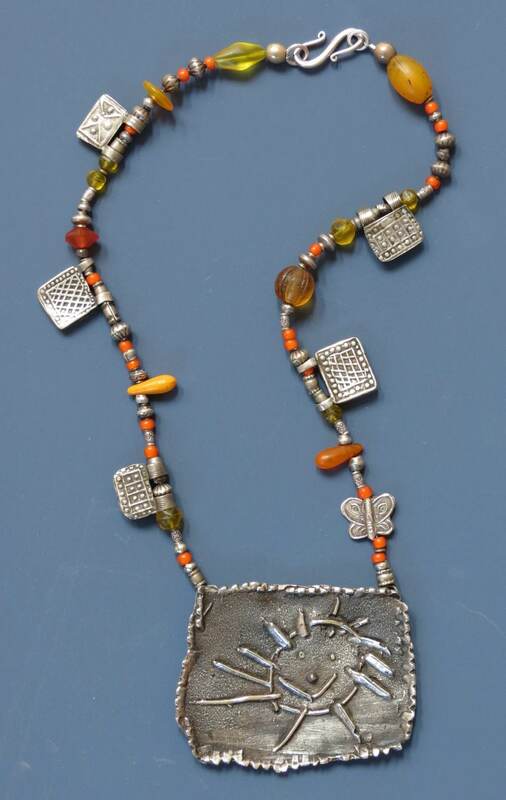 The raised bumpy edge around the medallions had a bead-like quality that inspired me to buy antique silver and glass trade beads from which I hung Zack’s trains, the cats for his aunt and his grandmother, and a big shining sun for me. It pleased Zack to see me wearing what he created. 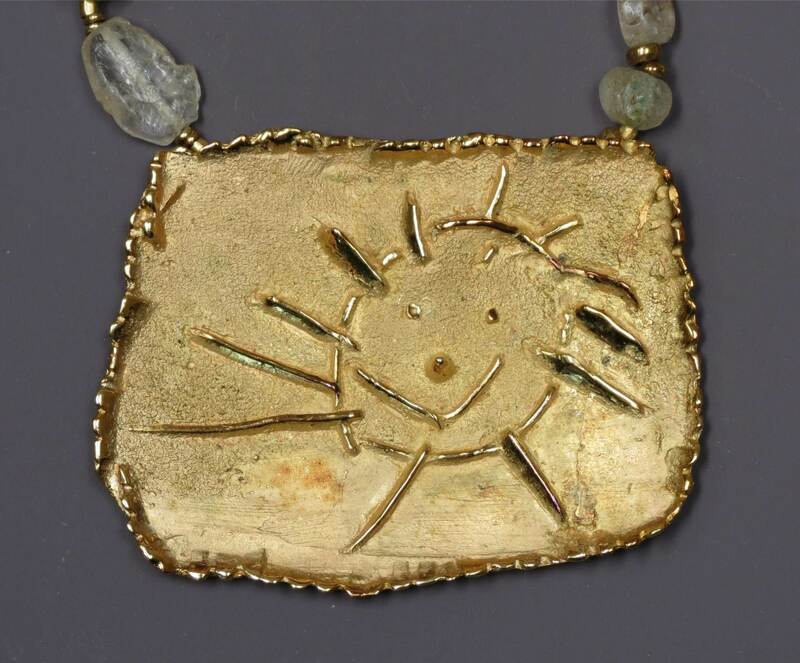 But for him, this silver jewelry was neither more nor less special than the brooch he made in school of macaroni and gold paint on cardboard, a safety pin glued to the back. But, for me, I was trying to save bits of my boy in sterling , a material that would not crumble, fade or shrivel. These talismans would harbor my child, his sun face smiling against my breast long after he was gone. As a mother, I could not stop his illness, nor save him; as an artist I tried to save our love, to freeze our time together in the hardness of metal. Zack’s last drawing, done a day or two before he died in my arms at home, was an image of a train cracked into shards, as shattered as his body. After Zack’s death we were invited to participate in a film and then a gala benefit in Washington D.C. for the newly formed Pediatric Aids Foundation. I wanted to wear a special Zack necklace for this black tie event. I made a mold and duplicated his smiling sun — a rectangle of about an inch by three inches – and had it electroplated in the deep yellow of 24 karat. On the night of the event, Zack’s golden sun shines on my breast. I never could have imagined, on that morning I awoke with an image of a simple silver belt, what a gift a dream would offer: not only a return to an artist’s life, but a place to express, hold and transform grief. If it were not for that dream, I would not own this object that brings solace at a time when I would gladly give up being an artist forever to have my boy back. On that night of the gala, I can’t imagine that someday I’ll become an art psychotherapist, that I will help others find their own generative processes to transform pain and loss, to make their own containers for grief. That night, all I think of is my son. As I walk up the steps into the celebrity-filled party, surrounded by press, flash bulbs and television cameras, a woman reporter says to me: “What a lovely and unusual necklace you have!” I reply, “Thank you. My son Zack, who died of AIDS at age five, created this.” The brief exchange carries enormous charge for me. It means that my boy has not disappeared without a trace. His presence on the planet has been noticed, his death noted. Perhaps our necklace will be mentioned on the late news and, for an instant, someone will think about a little boy who shone like a sun in his short time here. My dad had a great ear and a gift for mimicry and at dinner he would regale us with the language he’d heard in his chair that day, speaking with a perfect Berlinese, Viennese or Hungarian accent. One evening he recounted, in the appropriate dialect, that Mrs Hochfeldt, an elderly German patient, said that she believed in reincarnation and that she had been an Egyptian princess in her past life. Pop told us he replied that he must have been a dentist in his, because his feet still hurt. Pop was a great joke teller as well as a mimic, and often left his patients laughing. They usually brought him gifts, mostly things to eat. As a child, my favorite were the candies from another émigré, the fine chocolatier Tibor Metzner, who would bring Pop’s favorite “Lehar” (after the Viennese composer Franz Lehar), a filling of minced hazelnut praline and bittersweet chocolate inside a coat of the darkest chocolate we’d ever tasted. Tibor once named a new candy after me, but decided he didn’t think it was good enough to add to his glass case of sweets in their ruffled black dresses, to my great disappointment. One of Dad’s most beloved patients was Fritz Lang, the great director of Metropolis and the masterpiece M, with Peter Lorre. Lang began his career making German Expressionist art films but went on to marry that aesthetic to popular entertainment, making a name for himself as a great in Film Noir. Fritz said that Goebbels, the Reich’s propaganda minister called him to his office to tell him that the Testament of Dr. Mabuse was being banned, but to also offer him the post of head of the German film studio. Fritz, whose mother was born Jewish, although she had converted to Catholicism and raised him as a Catholic, quickly fled Germany. (Leni Reifienstahl took the post). The monocle wearing Lang had a reputation for being autocratic, overbearing and severe, extremely mean to his actors. But he was a pussycat around my dad, sweet as Tibor’s candy. I don’t know whether it was because he loved him or because one’s dentist has the power to inflict pain. Probably both. My father must have mentioned my activities to his patients while they were captive in his chair, for when I was in my twenties and starting to work as a costume and set designer, Fritz brought in a rare old book by Ram Gopal, a famous Indian dancer, that had beautiful costume drawings. It was inscribed by the author to Fritz and Fritz inscribed it to me. At the time, Fritz was losing his eyesight, long unable to make films, but was still quite a dashing and imposing man. He died shortly thereafter, in 1976. In the 1950s and sixties Pop’s evening routine was the same. He arrived home for dinner at 6:00 sharp (no “Madmen” style cocktail hour, he rarely drank), after which he’d nap on the couch, asking me to remove his shiny black oxfords or loosen the laces for him. Then he would get up, put on his blue striped twill apron and go into a small closet he had fitted with a workbench and a stereo speaker. There he would work late into the night carving waxes for crowns and bridges while listening to classical music on the radio. Pop would cast the wax into gold in his office, and then bring it home again. He wore a magnifying visor so that he could smooth and polish the metal to perfection. Lilly Latte, Fritz’s widow, gave my father this magnifier after Fritz died and Dad used it for many years. 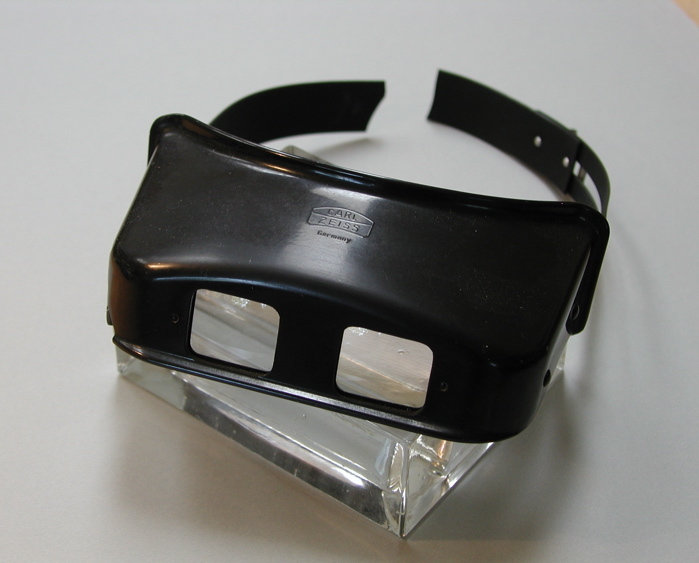 The visor is quite old, perhaps bakelite plastic , made by Zeiss, manufacturers of the finest optics in the world. It says “Carl Zeiss, Germany” on the front, but I don’t know whether Fritz brought it with him from Europe or bought it after the war. 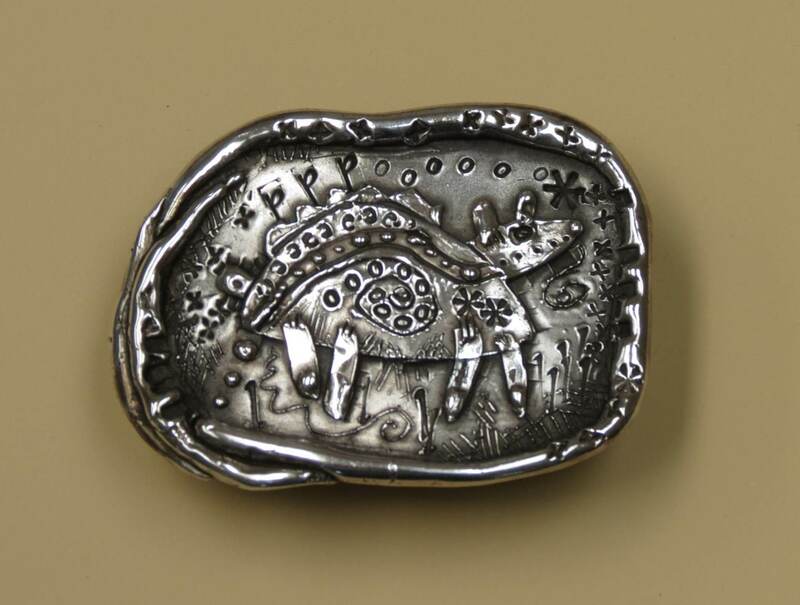 When I was making jewelry and silver smithing, in the late 1980s, my father gave it to me. I used it for years as well. Then one day I dropped something on it and the band that goes around the head broke. Although unwearable, I could could never bear to throw it away, packing it along on several moves. I am determined that – one of these days – I will rivet a strip of leather on the band and rescue it. How can I discard something that belonged to the great Fritz Lang, handed down to my father, also long gone. Did Fritz examine film strips while wearing it? Read scripts as he was losing his eyesight? It is an object redolent with history and the memory of two men with talents, one world famous, the other beloved but unknown. When I looked through the visor, something small was made large, seemingly brought closer. Now, even in its broken state, it brings something faraway close as well: I see Kaufie and Fritz laughing together as they so often did, arms on each other’s shoulders, sharing a box of Viennese chocolates.